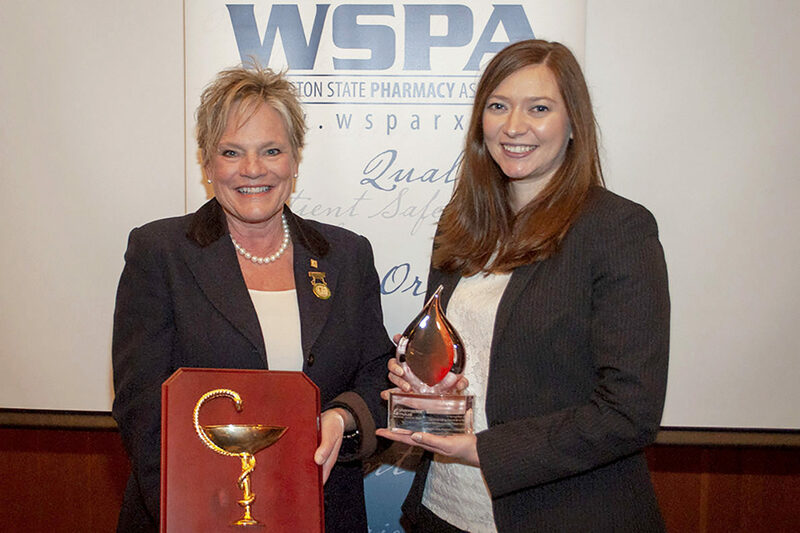 WSU Spokane faculty members Linda Garrelts MacLean and Kimberly McKeirnan, l‑r, and received Awards of Distinction from the Washington State Pharmacy Association. Two Washington State University faculty members and a student received Awards of Distinction from the Washington State Pharmacy Association during the group’s annual meeting on Nov. 10 at the Skamania Lodge in Stevenson, Washington. WSU Spokane faculty members Kimberly McKeirnan and Linda Garrelts MacLean were recognized during the awards luncheon in the meeting, along with student pharmacist David Bunch. Kimberly McKeirnan received the Distinguished Young Pharmacist of the Year Award, which recognizes pharmacists who have been licensed in the profession less than 10 years and who have been innovators in pharmacy practice and enthusiastic participants in association activities. McKeirnan is a clinical assistant professor in the Department of Pharmacotherapy at the WSU’s College of Pharmacy and Pharmaceutical Sciences. McKeirnan was selected because of her work in improving immunization rates in rural areas, developing a model for implementing chronic disease-state management services in community pharmacies and developing a pharmacy technician immunization training program. Linda Garrelts MacLean received the Bowl of Hygeia Award. The Bowl of Hygeia is the most widely recognized international symbol of pharmacy and derives from Greek mythology. This award recognizes pharmacists who have distinguished themselves in their careers through action. “Linda is a passionate and active advocate for a future pharmacy practice where community pharmacists assess patients and are responsible for outcomes, communicating with other health care providers to ensure continuity of care,” said WSPA President Beverly Sheridan during the award ceremony. MacLean is a clinical professor and the vice dean for external relations for the College of Pharmacy and Pharmaceutical Sciences. She is a past-president of the WSPA and a past trustee for the American Pharmacists Association. She currently serves as a board member and the vice president for the Community Pharmacy Foundation, an organization dedicated to maximizing the community pharmacist’s role in improved patient care. “Thank you for allowing me to share in recognizing the accomplishments of a deserving recipient and one who epitomizes the principles of community service for which this award was developed,” Sheridan said. Receiving the 2018 Pharmacy Student of the Year Award from the WSPA was Bunch. He was recognized for his consistent, sustained and outstanding contributions toward fostering student pharmacist participation in association activities on both a local and state level. Bunch is passionate about patient care and advancing the profession of pharmacy through advocacy. He has served as the WSU liaison to the WSPA Board of Directors, American Pharmacists Association Academy of Student Pharmacists (APhA-ASP) chapter policy vice president, APhA-ASP regional delegate, and as a member on multiple committees. Bunch is currently serving on the APhA-ASP National Policy Standing Committee and is a student representative for the WSPA Ambulatory Care Academy. Bunch is from Oak Harbor, Washington. He completed his undergraduate coursework at Whitworth University and is in his final year of pharmacy school at WSU Spokane. After graduation, he plans to pursue a residency and continue his involvement in pharmacy associations. The WSPA is the professional trade association representing pharmacists, student pharmacists and pharmacy technicians in all practice settings across Washington state. The WSPA advocates on behalf of its members to ensure pharmacy professionals are recognized, engaged and valued as essential to the health care team. Awardees are nominated by their peers and selected by a WSPA awards committee.